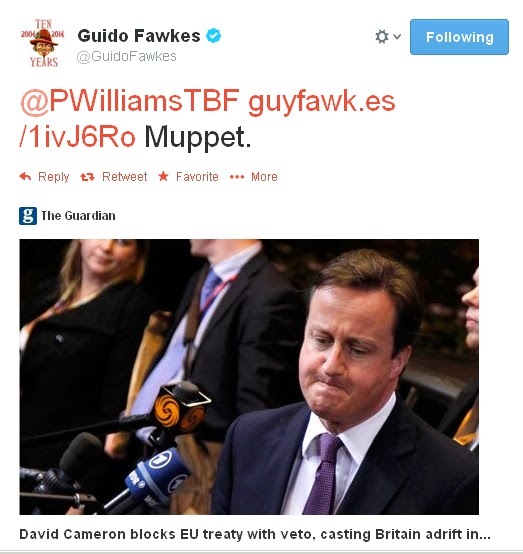 Guido Fawkes, a blogger of some self-importance, has taken it upon himself to label me a "Muppet" on Twitter. My crime? Merely to point out that Cameron's apparent veto in 2011 was nonsense on stilts. We are briefed that Blair is the official unofficial candidate of the FCO for permanent President of the Council of Europe. As regular readers know, and has been well rehearsed, there was no veto. Nor could there have been as it's extremely difficult to veto a Treaty which does not exist and the power of a veto is not available. It's worth remembering that David Cameron only initially confirmed that he "effectively vetoed". Ah the word 'effectively'? It’s rather like running a mile every day for 26 days and then declaring "I effectively ran a marathon". Not a lie essentially but crucially neither is it the truth. Newspapers of course don't pander to such nuances or subtleties - remove the word 'effectively' and there is your headline. Mr Jack Straw (Blackburn) (Lab): There was no draft treaty before the European Council last Thursday and Friday; there was a set of draft conclusions. Will the Prime Minister set out the paragraph numbers that he thinks would have damaged Britain’s interests had we agreed to them? Will he also confirm that we had a veto on a financial transactions tax before the Council and that we still have one; and that financial services regulation was subject to qualified majority voting before last Thursday and still is? “This is the first veto in history not to stop something. The plans are going right ahead. It was a phantom veto against a phantom threat". But I guess pointing out the facts make me a "Muppet" - Guido with his head so far up the arse of the establishment is no different to the rest of the media where reporting the details is far beyond their comprehension. And how ironic, and rather odd, that to make his case on Twitter to me Guido links to the Guardian – a newspaper he frequently derides. TBF, if it's any comfort at least it generated some publicity for you. What I don't follow is how come Guido writes a blog and get to be a recognised political pundit? I do the same and I don't. My old Contract Law professor used to say a half-lie was more deceiving than a total lie. Effectively. Guido is a typical political gossipmonger rather than a serious investigator. Well done for pointing out the facts. EU: Another Empty Referendum Promise?